This Deck Was Damaged In A Wind Storm. Craftsman Contracting Replaced The Railings And Installed A Contrasting Border Around The Edge – See Our Blog For More Info. We specialize in completing all those little tasks nobody else wants to do! There are a variety of small repair tasks that are just waiting to be done in every household across the state. Your home may even have a few items on a “honey do” list that need to be tended to sooner than later. Maybe it’s a broken down fence or inoperable gate that needs repair? 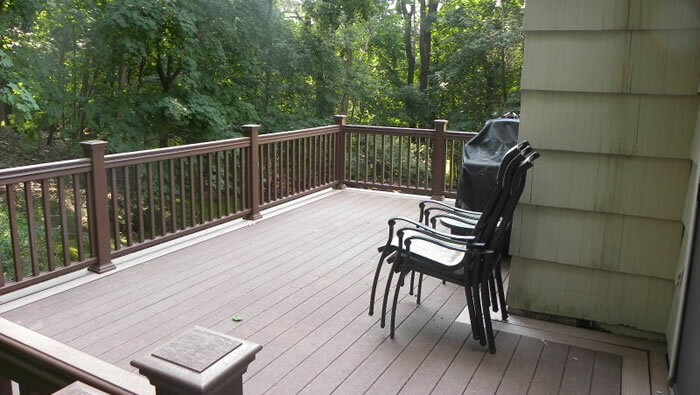 Maybe it’s a deck that is currently unsafe to use? Or some interior doors that need replacement? you get the picture! Sometimes it’s a lot more relaxing to just make a phone call and have a professional come out and fix everything properly. Craftsman Contracting is a local family-owned and operated carpentry contractor that also specializes as a Handyman. We cover a diverse range of services that could qualify as a handyman service from very simple projects to very complex, all designed to keep you from having to go to the hardware store and waste away your weekend doing these on your own. What do you need fixed or repaired? While we provide a wide variety of handyman and home improvement services there are some services we just cannot provide do to legalities and insurance constraints, such as working on gas piping for instance. If we aren’t able to complete a task for you, we’ll certainly be able to refer you to someone who can. When we arrive to your home we can walk-thru, you’ll show us the issues you’d like repaired and we’ll take any necessary notes. We’ll then put together a material list, and an estimated cost for labor to complete all the repairs for you. Why Choose Craftsman Contracting For Your Handyman Projects? When you choose to hire Craftsman Contracting for your handyman projects you are partnering with a team of craftsman who’s collective goal is to make your home a better place. We’ll treat your project as if it were our very own, ensuring the highest level of quality in everything we do. Whether you’d like to have some custom carpentry work completed, a repair to your deck, or any of dozens of different home repair items, we at Craftsman Contracting pride ourselves on the attention to detail and quality of our workmanship that we invest into each and every carpentry project we work on. If you’d like to schedule a consultation to discuss your list of handyman projects then give us a call (203) 642-3343 or fill out our contact form and we’ll get right back to you.